Sue Westin is a versatile artist, having worked in stone, theorem painting, watercolors and oils. She has painted on paper, stretched canvas, gessoed board and even gessoed paper with stone dust applied. If one were to look at her work over the years, one would find a true smorgasbord of subjects as well: wildlife, still life, landscapes, architectural scenes, marine scenes, domestic animals, figure and human portraiture. She considers art and life to be an adventure. Sue Westin's works have been exhibited in Canada, Japan, Sweden, Germany, Kenya, The National Arts For The Parks Competitions and museums throughout the United States, and have been exhibited repeatedly in the Leigh Yawkey Woodson Art Museum's annual "Birds In Art" exhibitions and in over twenty annual juried exhibitions of the international Society Of Animal Artists. Westin has won numerous awards from national and international exhibitions. 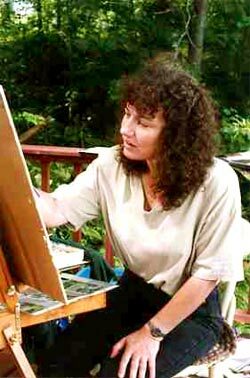 Today Sue Westin and her artist husband John C. Pitcher have their home and studios on the beautiful shores of the Dorset Marsh in Dorset, Vermont. There they greet visitors to their Gallery On The Marsh and share in the joy of an abundance of wildlife and beauty right outside their doors.